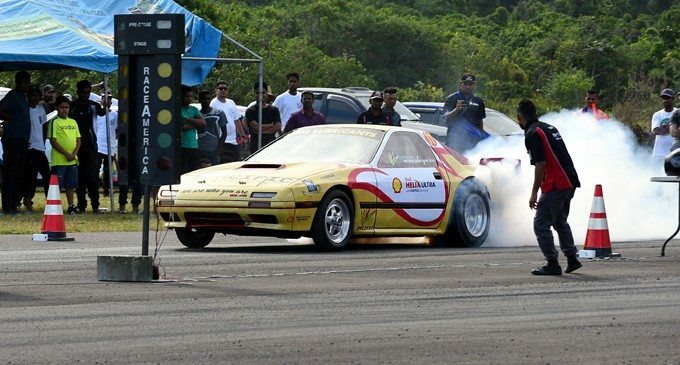 The fourth series of the Pacific Energy Car Drag Race flagged off at Nanuku Air Strip in Pacific Harbour yesterday. The event attracted forty one participants some of whom came from as far as New Zealand. The Race was watched by a sizeable crowd of more than four hundred and fifty spectators. First Runner Up: Roy Singh-11.726s. Second Runner Up: Amal Singh-12.170s. Sandeep Prakash, Fiji Car Club Vice President bemoaned of poor performance by the participants. He said that participants had not performed exceptionally in that none of the winners clocked timings which were above their respective highest personal records. However, the Vice President expressed happiness with the turn out. He observed that although the Race took place during Diwali season and also considering that Courts Inter-district Championship was taking place as well in Lautoka, participation was as expected. He further stated that despite the bad weather, spectators endured and turned up in numbers to watch the Race. The Vice President further said that apart from the Race, Fiji Cancer Society held a campaign alongside to promote Pinktober. The funds that were raised from entry fees went to the Society.